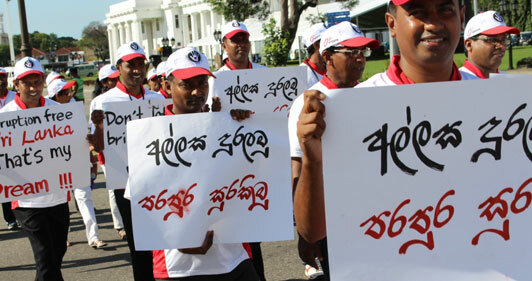 Thousands of Politicians, government officials, trade union leaders, civil society leaders and professionals took to the streets in Colombo Yesterday to voice against corruption and bribery. The TISL and CIABOC led walk attracted all walks of life and they displayed banners chanted slogans against the corruption. 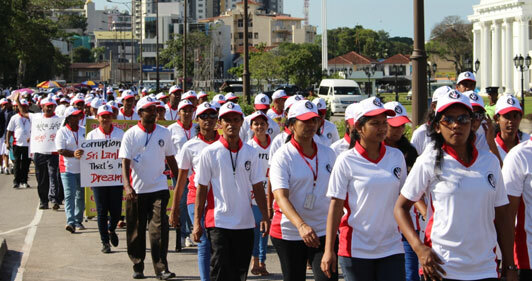 After the walk a National event was held in Independence Square to mark the United Nations Anti – Corruption day under the patronage of the President Maithreepala Sirisena. The walk will commenced from the Viharamahadevi Park at 3pm and reached the Independence Square before the special awareness programme. An integrity oath was taken from all the politicians, state officials, trade union leaders and public who took part in the event to show their opposition to corruption. The CIABOC announced a seven step strategy to prevent corruption happening in public sector and special amendment to the Assets and Liabilities act was also handed over to the President by Executive Director of the TISL. I paid a bribe website also launched at the event.